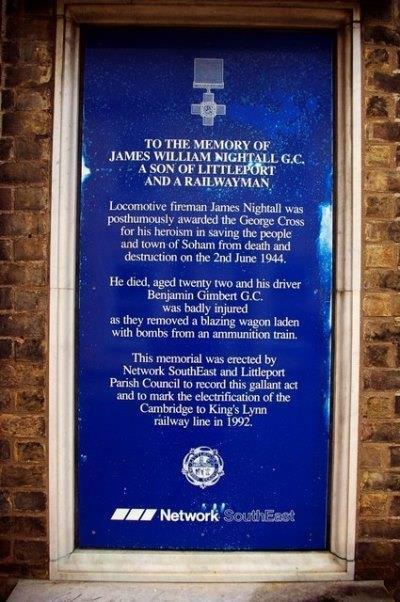 To the memory of James William Nightall GC, a son of Littleport and a railwayman. "Locomotive fireman James Nightall was posthumously awarded the George Cross for his heroism in saving the people and town of Soham from death and destruction on the 2nd June 1944. "He died, aged twenty-two and his driver Benjamin Gimbert GC was badly injured as they removed a blazing wagon laden with bombs from an ammunition train. "This memorial was erected by Network SouthEast and Littleport Parish Council to record this gallant act and to mark the electrification of the Cambridge to King's Lynn railway line in 1992.